The human body is controlled and coordinated by the nervous system. This system is so important that the body created a bony armor for it in the form of the skull to protect the brain, and the vertebrae to house the spinal cord. This system requires both structural strength and mobility to do its job. Due to physical, chemical and mental/emotional stress, the spine can frequently become misaligned and “stuck” (known as a vertebral subluxation). Subluxation creates pressure and tension on the spinal cord and nerves, resulting in altered or disturbed nerve system function. Chiropractors are trained to locate, analyze and correct these damaging subluxations through gentle chiropractic adjustment, restoring optimal function and good health. Chiropractic has been safely and effectively helping people since 1895. Chiropractic works and we can show it! 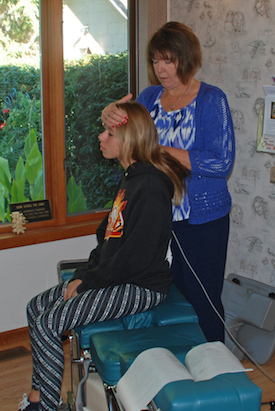 Our carefully selected techniques have proven themselves to be effective in locating and correcting vertebral subluxations, thus improving body function and optimizing wellness potential. Adjustments are made primarily with our patient in the prone, or face-down, position using our hands, table mechanisms and/or the Precision Spinal Adjusting Instrument. The choice of adjusting technique is determined by the doctor according to what is most appropriate for the correction of the patient’s subluxations, unless the patient has a preference. All chiropractic adjusting methods used in our practice are safe and effective in addressing and correcting vertebral subluxation misalignment. Patient comfort and preferences are always considered. Although chiropractic care has a reputation for excellence in restoring good health and eliminating discomfort, it has many other benefits as well. Patients often comment that they’re sleeping better, reducing digestive issues, feeling more focused and attentive, and healing from injury much faster. If you’re new to chiropractic, we understand that you may feel a little bit of apprehension. You’ll find that our techniques are gentle enough for a newborn baby, allowing your body to make positive changes in the positioning and mobility of all spinal joints. We’ll guide you every step of the way to make your time with us rewarding and exceptional. It won’t be long before you find yourself looking forward to every visit! Our warm and friendly office works hard to obtain your trust, and our goal is to make a positive impact on your health. We accept insurance, including Medicare, and offer late hours and on-site X-rays. Contact us now! Because we value our service men and women and appreciate the sacrifices they make for our country, we want to do what we can to return the favor. Therefore, all returning veterans as well as those on leave, will receive care at no charge in our office for the first year after they return home. All the vet needs to do is call our office and let us know of their status and they will be eligible for this program.